Robert, otherwise known as Robert the Doll, Robert the haunted doll, or Robert the Enchanted Doll, is a doll exhibited at the East Martello Museum that was once owned by Key West, Florida painter and author Robert Eugene Otto. According to legend, the doll is haunted. The doll originally belonged to Robert Eugene Otto, an artist described as "eccentric" who belonged to a prominent Key West family. The doll was reportedly manufactured by the Steiff Company of Germany, purchased by Otto's grandfather while on a trip to Germany in 1904, and given to young Otto as a birthday gift. The doll's sailor suit was likely an outfit that Otto wore as a child. The doll remained stored in the Otto family home at 534 Eaton Street in Key West while Otto studied art in New York and Paris. Otto married Annette Parker in Paris on May 3, 1930. The couple returned to the Otto family home in Key West to live there until Otto died in 1974. His wife died two years later. After their deaths, the Eaton Street home containing the doll was sold to Myrtle Reuter, who owned it for 20 years until the property was sold to the current owners, who operate it as a guest house. In 1994, the doll was donated to the East Martello Museum in Key West, Florida, where it eventually became a popular tourist attraction. It is annually rotated to the Old Post Office and Customhouse in October. According to legend, the doll has supernatural abilities that allow it to move, change its facial expressions, and make giggling sounds. Some versions of the legend claim that a young girl of "Bahamian descent" gave Otto the doll as a gift or as "retaliation for a wrongdoing". Other stories claim that the doll moved voodoo figurines around the room, and was "aware of what went on around him". Still other legends claim that the doll "vanished" after Otto's house changed ownership a number of times after his death, or that young Otto triggered the doll's supernatural powers by blaming his childhood mishaps on the doll. According to local folklore, the doll has caused "car accidents, broken bones, job loss, divorce and a cornucopia of other misfortunes", and museum visitors supposedly experience "post-visit misfortunes" for "failing to respect Robert". 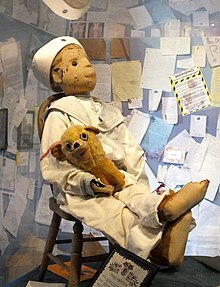 The doll was exhibited at TapsCON, a convention hosted by The Atlantic Paranormal Society held in Clearwater, Florida in May 2008, marking the first time that it had left Key West, Florida in its then-104 years of existence. In October 2015, the doll was taken to Las Vegas to appear on the Travel Channel television program, Zak Bagans: Mystery Mansion. A horror film based on the legend and titled Robert was released in 2015. A sequel titled The Curse of Robert the Doll was released in 2016. A second sequel titled The Toymaker followed in 2017. A third sequel titled The Revenge of Robert the Doll was released in 2018. The doll and a replica doll sold at the gift shop at the Martello museum appeared in the second season of Ozzy & Jack's World Detour. The doll was featured in an episode of the podcast and TV series Lore. ^ a b "ROBERT THE DOLL". www.robertthedoll.org. ^ Ella Morton (2013-11-18). "Robert the Haunted Doll: Creeping Out Floridians Since 1904". Slate.com. ^ a b c "The Story Behind the World's Most Terrifying Haunted Doll". atlasobscura.com. 26 October 2015. ^ a b "Artist House - History". Artist House. Artist House, Key West. Retrieved 1 December 2017. ^ a b "Robert The Doll – Artist House Key West – Key West Guesthouse". www.artisthousekeywest.com. ^ "History of Fort East Martello – Key West Art and Historical Society". kwahs.org. ^ "Fort East Martello Museum (Key West, FL): Top Tips Before You Go (with Photos) – TripAdvisor". www.tripadvisor.com. ^ "Halloween Story The Legend of Robert the Doll". floridakeystreasures.com. 4 November 2017. ^ Weikle, Harlan (22 July 2018). "TAPS hunts for things that go bump in the night". TBNweekly. BLOX Content Management System. Archived from the original on 25 December 2018. Retrieved 1 December 2017. ^ Shaughnessy, Carol (29 October 2015). "Robert the Doll Goes to Vegas". Key Voices. The Florida Keys & Key West. The Monroe County Tourist Development Council. Retrieved 1 December 2017. ^ "The Curse of Robert the Doll (2016)". Rotten Tomatoes. Fandango. Retrieved 1 December 2017. ^ "THE CURSE OF ROBERT THE DOLL". British Board of Film Classification. Retrieved 1 December 2017. ^ Phalin, Mike (22 March 2018). "Filmmaker Andrew Jones Talks Killer Dolls, Jurassic Terrors, and Nazi Werewolves". Fanbolt. Retrieved 5 April 2018. ^ "S2 E1, Like Father, Like Sun". AETV.com. A&E Television Networks. Archived from the original on 10 July 2018. Retrieved 26 February 2018. ^ Rubin, Rebecca (13 October 2017). "Remote Controlled: Stars of Amazon's 'Lore' Discuss Horror Stories, What Scares Them". Variety. Penske Business Media, LLC. Retrieved 26 February 2018.